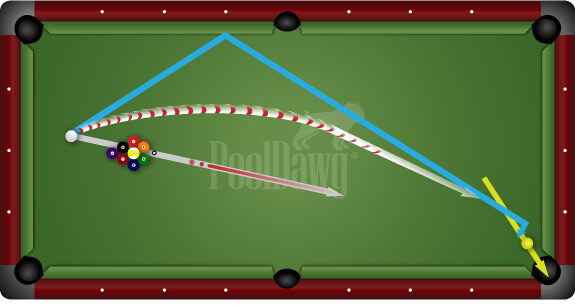 One of the big questions that we have to ask ourselves when we play rotation games like 9-ball is, what happens when we are stuck behind another ball and can’t see our next shot? How do we hit the next ball? Or, how can I hit the next ball and either make it or get my opponent in trouble? In these situations, we have four basic choices. We can take a scratch, which is almost never your best option, we can jump the obstacle balls, curve around them, or kick towards the ball off the rail. But how do we decide what to do? Let’s look at some ideas that will help you. If you’re a beginner who’s still working on these skills, you owe it to yourself to put some practice time in. Start with kick shots, then move to jumps and curves. Here is a great drill to use while practicing kick, jump, and curve shots. You need to hit the 1-ball, but the 9-ball is in the way. Practice kicking off the rail, curving around the obstruction, and taking a jump shot. See what shot is most comfortable for you, then try with the two ball, and so on. As you can see, the 1-ball is blocked by the 9-ball. Try and hit the 1 by jumping over the 9, curving around the 9, and kicking one rail at the nine. This drill is designed to help you learn to control the trajectory of your cue ball when it jumps or curves. Once you have the direction down, knowing how hard to hit a jump shot or a curve shot is the key to hitting your target with a good result. Now, back to deciding what to do. Take a look at the 1-ball in this diagram. What works best in this situation, a jump, a kick, or a curve? Always choose the option with the most room for error. 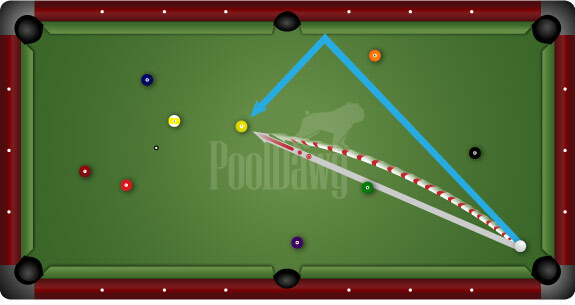 In order to sink the 1-ball, it needs to enter the pocket on a specific line, shown here in yellow. 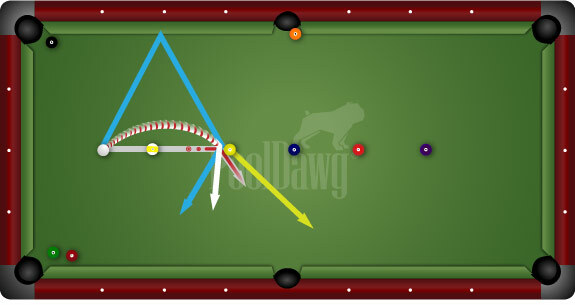 Notice how the 1-ball is close to the short rail and on the top side of the corner pocket. With the object ball close to both the rail and the pocket, I think a jump shot is risky here. The better option is to kick one rail, or if that path is blocked, curve around the left side of the obstructing balls. Frank Says: "Are you afraid of damaging your cloth while you try jump and curve shots? Then you have to try Stefano Pelinga’s Cloth Shields, they’re perfect for practicing!" Ask yourself, “Where do we have the least room for error?” Generally speaking, the kick gives us the biggest chance of pocketing or hitting the 1 because we only have to control direction. For the curve shot, we have to control the speed to have the cue ball curve at the right place, which can be tricky and takes practice. With the kick and the curve, we are also protected by the object ball from the scratch. With a jump shot, we have to control the trajectory and the direction of the cue ball, and with the object ball near a rail, we always have the possibility that the cue ball will jump off the table after it hits the object ball. So in this case your best options, in order, are kick, curve and then jump. What do you think? Jump, kick, or curve? The answer isn’t always easy, so make sure you slow down and weigh out your options. Here the object ball is in the middle of the table. I don’t like a kick off the long rail because of how tight the angle is. The jump shot is pretty far, and there is only a little piece of the 6 in the way of a straight on shot. I like curving the cue ball around the right side of the 6-ball because that seems like the easiest thing to do in this situation. I realize we all have different skill sets and might think one option is better than the other. The key is to take the shot that has the highest probability of success and the lowest chance of something going wrong. Good luck and see you on the road.